Forget Lord Flashheart, only Melchy and the Prince Regent can save us! We Brits are known for our sense of class, or to be precise, upper class. 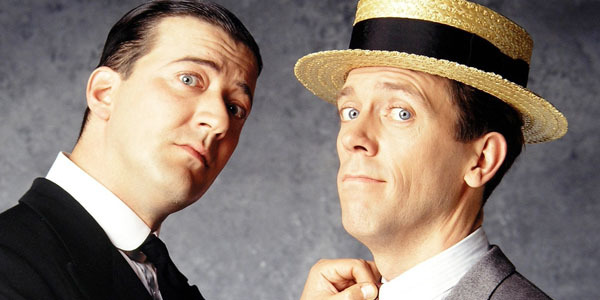 Hugh Laurie and Stephen Fry embody this stereotype beautifully, whether its stealing the spotlight from Rowan Atkinson in the various Blackadders, playing to their perceived personas in Jeeves and Wooster, or indulging in the middle class alternative to Bottom with their sketch show A Bit of Fry and Laurie. Its been two years since it was reported that the duo would be getting back together for a one-off adaptation of the Oscar Wilde novel The Canterville Ghost, but not a peep has been heard since then. But what Im asking for here isnt just a one off, I, and Im sure many others included, wouldnt mind something a bit more permanent. Obviously, and sadly, the pair are in no position to warrant a substantial reunion. Theyre both keeping themselves contently busy in different parts of the world. And its not like theyre doing badly, QI remains as popular as ever and Hughs transition from highest-paid actor in the galaxy to bluesman is progressing nicely. But how about we go back to those old shows, where Hugh, as the bumbling Bertie Wooster, was often saved from disastrous marriages thanks to the Gandalf-like figure of Frys Jeeves, or any scene in Blackadder Goes Forth that features a brief moment between General Melchett and Lieutenant George. Its all very well Stephen teaching Alan Davies how not to be a moron, or listening to Hughs whiskey-drenched voice tangle with blues drummers, but the spark between Fry and Laurie themselves is unbeatable. So lets take a look then at five reasons why these two legends should put aside their quite interesting facts and their blues records and go back to living under one roof.